^ Robert H. Hewsen. "The Meliks of Eastern Armenia: A Preliminary Study". Revue des etudes Arméniennes. NS: IX, 1972, pp. 288. ^ Viviano, Frank. 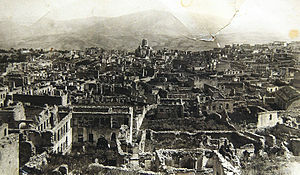 The Rebirth of Armenia. National Geographic Magazine. March 2004. 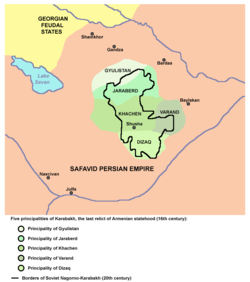 ^ 6.0 6.1 Hewsen, Robert H. Ethno-History and the Armenian Influence upon the Caucasian Albanians. (编) Samuelian, Thomas J. Classical Armenian Culture. Influences and Creativity. Chicago: Scholars Press. 1982: 27–40. ISBN 0-89130-565-3. ^ Hewsen, Robert H. "The Kingdom of Artsakh", in T. Samuelian & M. Stone, eds. 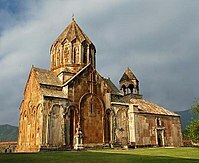 Medieval Armenian Culture. Chico, CA, 1983. ^ Hewsen. Armenia, pp. 100-103. ^ Movses Kalankatuatsi. History of the Land of Aluank, Book I, chapters 27, 28 and 29; Book II, chapter 3. ^ 19.0 19.1 19.2 Robert H. Hewsen, Armenia: A Historical Atlas. The University of Chicago Press, 2001, pp. 119, 155, 163, 264–65. ^ Robert H. Hewsen. Russian–Armenian relations, 1700–1828. Society of Armenian Studies, N4, Cambridge, Massachusetts, 1984, p 37. 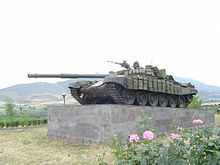 ^ 26.0 26.1 26.2 26.3 26.4 26.5 26.6 Cornell, Svante E. The Nagorno-Karabakh ConflictPDF (1.05 MB). Uppsala: Department of East European Studies, April 1999. ^ （俄文） Abbas-gulu Aga Bakikhanov. Golestan-i Iram; according to an 18th-century local Turkic-Muslim writer Mirza Adigezal bey, Nadir shah placed Karabakh under his own control, while a 19th-century local Turkic Muslim writer Abbas-gulu Aga Bakikhanov states that the shah placed Karabakh under the control of the governor of Tabriz. ^ （俄文） Просительные пункты и клятвенное обещание Ибраим-хана. 互联网档案馆的存檔，存档日期2008-05-09. ^ Tim Potier. 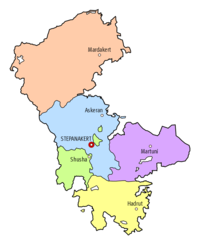 Conflict in Nagorno-Karabakh, Abkhazia and South Ossetia: A Legal Appraisal. Martinus Nijhoff Publishers, 2001, p. 2. ISBN 90-411-1477-7. ^ Leonidas Themistocles Chrysanthopoulos. Caucasus Chronicles: Nation-building and Diplomacy in Armenia, 1993–1994. Gomidas Institute, 2002, p. 8. ISBN 1-884630-05-7. ^ The British and Foreign Review. J. Ridgeway and sons, 1838, p. 422. ^ Taru Bahl, M.H. Syed. Encyclopaedia of the Muslim World. Anmol Publications PVT, 2003 p. 34. ISBN 81-261-1419-3. ^ The penny cyclopædia of the Society for the Diffusion of Useful Knowledge. 1833, Georgia. ^ Circular by colonel D. I. Shuttleworth of the British Command 互联网档案馆的存檔，存档日期2011-11-23. ^ 45.0 45.1 45.2 45.3 45.4 de Waal, Thomas. Black Garden: Armenia and Azerbaijan Through Peace and War. New York: New York University Press. 2003. ISBN 0-8147-1945-7. ^ Lieberman, Benjamin. Terrible Fate: Ethnic Cleansing in the Making of Modern Europe. Chicago: Ivan R. Dee. 2006: 284–92. ISBN 1-5666-3646-9. ^ The Encyclopedia of World History. Houghton Mifflin Harcourt. 2001: 906. ^ Roeder, Philip G. Where nation-states come from: institutional change in the age of nationalism. Princeton University Press. 2007: 51 [2011-10-10]. ISBN 0-691-13467-7. ^ Human Rights Watch. Playing the "Communal Card". 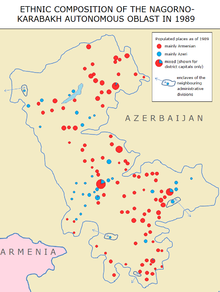 Communal Violence and Human Rights: "By early 1992 full-scale fighting broke out between Nagorno-Karabakh Armenians and Azerbaijani authorities." / "...Karabakh Armenian forces—often with the support of forces from the Republic of Armenia—conducted large-scale operations..." / "Because 1993 witnessed unrelenting Karabakh Armenian offensives against the Azerbaijani provinces surrounding Nagorno-Karabakh..." / "Since late 1993, the conflict has also clearly become internationalized: in addition to Azerbaijani and Karabakh Armenian forces, troops from the Republic of Armenia participate on the Karabakh side in fighting inside Azerbaijan and in Nagorno-Karabakh." ^ Human Rights Watch. The former Soviet Union. Human Rights Developments: "In 1992 the conflict grew far more lethal as both sides—the Azerbaijani National Army and free-lance militias fighting along with it, and ethnic Armenians and mercenaries fighting in the Popular Liberation Army of Artsakh—began." ^ United States Institute of Peace. Nagorno-Karabakh Searching for a Solution. Foreword 互联网档案馆的存檔，存档日期2008-12-02. : "Nagorno-Karabakh’s armed forces have not only fortified their region, but have also occupied a large swath of surrounding Azeri territory in the hopes of linking the enclave to Armenia." ^ United States Institute of Peace. Sovereignty after Empire. Self-Determination Movements in the Former Soviet Union. Hopes and Disappointments: Case Studies 互联网档案馆的存檔，存档日期2008-12-01. "Meanwhile, the conflict over Nagorno-Karabakh was gradually transforming into a full-scale war between Azeri and Karabakh irregulars, the latter receiving support from Armenia." / "Azerbaijan's objective advantage in terms of human and economic potential has so far been offset by the superior fighting skills and discipline of Nagorno-Karabakh's forces. After a series of offensives, retreats, and counteroffensives, Nagorno-Karabakh now controls a sizable portion of Azerbaijan proper ... including the Lachin corridor." ^ By Giving Karabakh Lands to Azerbaijan, Conflict Would Have Ended in ’97, Says Ter-Petrosian. Asbarez. Asbarez. April 19, 2011. ^ Ter-Petrosyan on the BBC: Karabakh conflict could have been resolved by giving certain territories to Azerbaijan. ArmeniaNow. ArmeniaNow. April 19, 2011. ^ Первый президент Армении о распаде СССР и Карабахе. BBC. BBC. April 18, 2011. 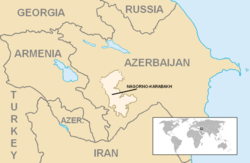 ^ No End in Sight to Fighting in Nagorno-Karabakh by Ivan Watson/National Public Radio. Weekend Edition Sunday, April 23, 2006. ^ Резолюция ПАСЕ по Карабаху: что дальше?. BBC Russian. ^ Resolutions on Political Affairs 互联网档案馆的存檔，存档日期2007-10-12.. The Thirty-Fourth Session of the Islamic Conference of Foreign Ministers. ^ RESOLUTIONS ON POLITICAL ISSUES ADOPTED BY THE COUNCIL OF FOREIGN MINISTERS (SESSION OF SHARED VISION OF A MORE SECURE AND PROSPEROUS ISLAMIC WORLD) DUSHANBE, REPUBLIC OF TAJIKISTAN 4-6 JAMADUL THANI 1431H(18-20 MAY 2010 互联网档案馆的存檔，存档日期2016年3月3日，. ^ "FM: Azerbaijan welcomes resolution 'Need for EU Strategy for South Caucasus' adopted by European Parliament." Trend.az. May 21, 2010. ^ "EU's Ashton Says Nagorno-Karabakh Elections Illegal." RFE/RL. May 21, 2010. ^ Bulgarian MEPs Urge EU to Be Proactive in South Caucasus. ^ "Azerbaijan military threat to Armenia." The Daily Telegraph. 22 November 2009. Retrieved 23 November 2009. ^ Defense Ministry: Armenian sniper kills three and wounds one Azerbaijani soldier. Trend. [2010-11-27]. ^ 71.0 71.1 Withdrawing snipers would not end conflict, says Baku. News.az. 27 September 2010 [2010-11-29]. ^ Murder of 9-year-old Azerbaijani civilian, Fariz Badalov. Parliamentary Assembly of the Council of Europe. [April 14, 2011]. （原始内容存档于2011年4月15日）. ^ JOINT COMMENTARY BY THE PRESS SERVICES OF THE MINISTRIES OF FOREIGN AFFAIRS AND DEFENSE OF THE NAGORNO KARABAKH REPUBLIC. ^ "Azerbaijani Drone Reportedly Downed Over Nagorno-Karabakh." RFE/RL. September 14, 2011. Retrieved September 14, 2011. ^ "Armenian soldiers killed in clashes with Azeri troops near Karabakh." RFE/RL. September 25, 2015. ^ "戰火重燃 阿塞拜疆亞美尼亞31死." RFE/RL. April 4, 2016. ^ 79.0 79.1 Zürcher, Christoph. The post-Soviet wars: rebellion, ethnic conflict, and nationhood in the Caucasus. NYU Press. 2007: 184. ISBN 0814797091. ^ DeRouen, Karl R. (ed.). Civil wars of the world: major conflicts since World War II, Volume 2. ABC-CLIO. 2007: 150. ISBN 1851099190. ^ Airports in Azerbaijan. Worldaerodata.com. [2013-08-13].